One of the recipes I most clearly remember from my days back in culinary school is this simple recipe for perfect glazed carrots. We learned it along with a few other classic side dishes, but for some reason this is the one that stuck in my head. Pour in cool water (or chicken broth) so that it just covers the carrots. The carrots should be completely submerged in the water, but there shouldn't be more than 1/4 of water above them. Drop in 3 tablespoons of butter cut into small pats, and 1 tablespoon of maple syrup (optional--I've done it without the syrup and it works well, too!). Sprinkle generously with salt and black pepper. Bring to a boil over high heat, then reduce heat to about medium high so that the water stays at a fast simmer (but not a hard boil). Let cook like this uncovered until nearly all the water has evaporated (about 12 minutes). Once the water has mostly evaporated, the carrots will be tender but still firm (no mushy carrots! ), and the butter will have turned into a lovely thick sauce. Use a spatula to gently toss the carrots in the butter glaze until completely coated. 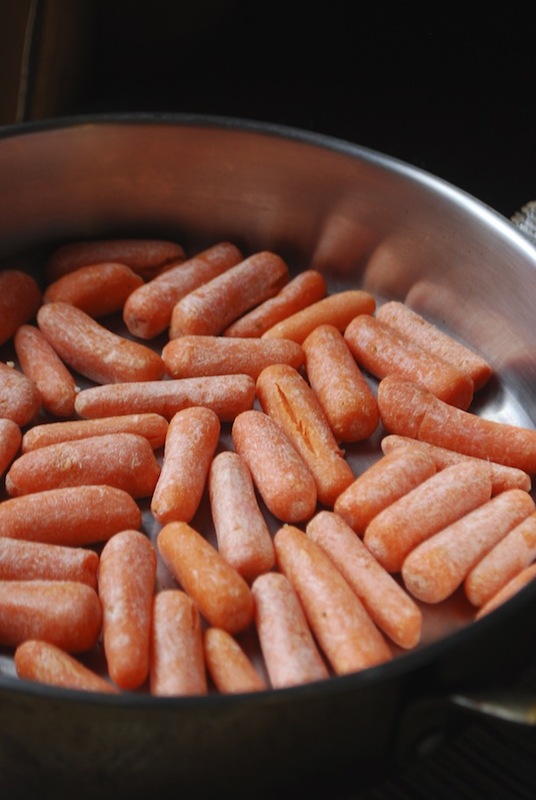 Spread baby carrots in a single layer in a large skillet or frying pan. Cover with water just until all the carrots are submerged (no more than 1/4 inch water above the carrots). Add the butter and maple syrup, and season with kosher salt and black pepper. Place over high heat and bring to a boil, then reduce to a strong simmer. Let cook until the water evaporated and reduces into a buttery syrup, about 12-15 minutes. Toss the carrots in the syrup to coat, adjust seasoning to taste, then serve immediately garnished with parsley.